IFN regulatory factor 4 (IRF4) is a key transcription factor that promotes effector CD8+ T cell differentiation and expansion. The roles of IRF4 in regulating the CD8+ T cell response to cytokines have not been explored. In this article, we show that IL-2 and IL-15 signaling and STAT5 activation regulate IRF4 expression in CD8+ T cells. Gene-expression profile analysis has also revealed that IRF4 is required for expression of the receptors of IL-2 family cytokines CD122 and CD127. We found that IRF4 binds directly to CD122 and CD127 gene loci, indicating that it may directly promote CD122 and CD127 gene transcription. As a consequence, IRF4-deficient CD8+ T cells show diminished sensitivity to IL-2, IL-15, and IL-7 treatment in vitro. Furthermore, we found that IRF4-deficient CD8+ T cells had lower expression of CD122 and CD127 in vivo during influenza virus infection. These data suggest that IRF4 regulates the sensitivity of CD8+ T cells to IL-2 family cytokines, which correlates with the diminished effector and memory CD8+ T cell responses in IRF4-deficient CD8+ T cells. As an indispensable part of adaptive immunity, CD8+ T cells protect the host from intracellular pathogens and cancerous cells. Three major signals, including TCR signaling, cell surface coreceptor signaling, and cytokine receptor signaling, cooperate to direct CD8+ T cell activation, effector differentiation, effector cell expansion, contraction, and the formation of memory CTLs during a robust immune response (1). Initially, TCR binding to the Ag/MHC complex, with the help of signals from cell surface coreceptors, leads to the assembly and activation of a proximal cytoplasm complex of molecules, which subsequently activates downstream signaling pathways, such as PI3K and MAPK (2). These signaling pathways further relay activation signals to various intracellular transcription programs that direct CD8+ T cell activation and proliferation, as well as effector and memory T cell formation (3). Activation of naive CD8+ T cells also leads to the expression of various cytokines and cytokine receptors, and the subsequent downstream cytokine signaling further modifies CD8+ T cell transcriptional programs to assist, guide, and sustain CD8+ T cell responses (4, 5). Among various cytokines that are important in CD8+ T cell–mediated immunity, IL-2 family cytokines, including IL-2, IL-7, and IL-15, play critical roles in regulating effector and memory CD8 T cell responses (5–12). IL-2, produced by activated CD4+ and CD8+ T cells, acts through paracrine and autocrine mechanisms to promote CD8 T cell proliferation and effector differentiation (i.e., gaining the ability to express various cytokines and cytotoxic molecules) (4, 13–16). IL-2 signaling also promotes the recall responses of memory CD8 T cells (15, 17). IL-15 and IL-7 signaling can promote effector CD8+ T cell proliferation and survival in the tissue, and they appear to be essential for memory CD8+ T cell maintenance and function (3, 9, 18). IL-2 induces intracellular signals through the IL-2R complex, consisting of CD25 (IL-2Rα), CD122 (IL-2/IL-15Rβ), and CD132 (common γ-chain). The IL-15R complex consists of a unique IL-15Rα subunit along with CD122 and CD132 subunits, whereas the IL-7R complex includes CD127 (IL-7Rα) and CD132. Stimulation of the receptor complexes by IL-2, IL-15, and IL-7 induces the activation of STAT5, which mediates the majority of the downstream effects of these cytokines (5). A number of transcription factors have been identified to play important roles in regulating effector and memory CD8+ T cell responses. For instance, IFN regulatory factor 4 (IRF4), BATF, T-bet, Blimp-1, and Id2 promote effector CD8+ T cell expansion and/or differentiation, whereas Eomes, Tcf1, BCL6, and Id3 are considered to support the generation of memory CD8+ T cells (3). Numerous loss-of-function and gain-of-function studies have demonstrated the independent actions of individual transcription factors, as well as synergy and cooperation among those transcriptions factors in governing effector and memory CD8+ T cell responses. IRF4, in particular, serves as an integrator to coordinate the expression and function of multiple transcriptional factors for effector CD8+ T cell differentiation and expansion (19–24). 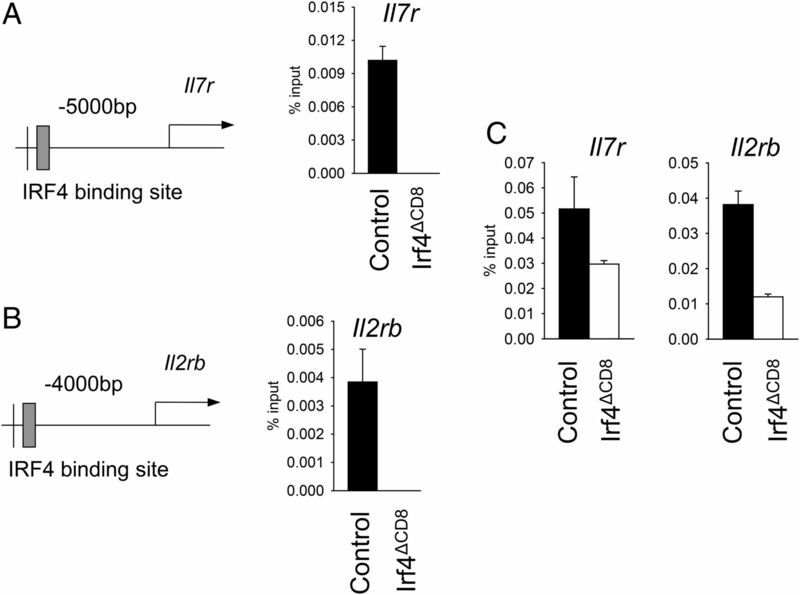 IRF4 interacts with BATF and is required for the expression of Hif1a, T-bet, and Blimp1 for sustaining effector CD8+ T cell differentiation and expansion (19, 21–24). IRF4 also represses Tcf1, Eomes, and BCL6 expression, which may promote the formation of terminal effector CD8 T cells over memory T cell generation (19, 22–24). Given the importance of IL-2, IL-7, and IL-15 in regulating effector and memory CD8+ T cell responses, we have investigated the potential functional interactions of these cytokines and IRF4. Through RNA sequencing (RNA-seq) analysis, we found that IRF4 is required for the expression of IL-2 family cytokine receptors CD122 and CD127. Furthermore, chromatin immunoprecipitation (ChIP) analysis showed that IRF4 directly binds to CD122 and CD127 gene loci, indicating that it may directly promote the transcription of CD122 and CD127 genes. We found that IRF4-deficient CD8 T cells were less sensitive to IL-2, IL-15, and IL-7 treatment during in vitro culture, and IRF4 deficiency in CD8+ T cells resulted in diminished expression of CD122 and CD127 in influenza-specific CD8+ T cells in vivo. These data suggested that IRF4 regulates the sensitivity of CD8+ T cells to IL-2 family cytokines. Wild-type (WT) C57BL/6 mice were purchased from The Jackson Laboratory. OVA-specific TCR-transgenic (OT-I) mice were bred in-house. Irf4ΔCD8 mice were generated by crossing Irf4 fl/fl mice with mice harboring the E8i-cre transgene, as previously described (22, 25). Controls for Irf4ΔCD8 mice were littermate Irf4 fl/fl mice without the E8i-cre transgene. Irf4 fl/fl and Irf4ΔCD8 mice were on a C57BL/6 background. All mice were housed in a specific pathogen–free environment, and all animal experiments were performed in accordance with protocols approved by the Indiana University Institutional Animal Care and Use Committee. Influenza A/PR8/34 (∼200 PFU per mouse) and recombinant PR8-OVA (∼400 PFU per mouse) infection was performed as described before (26). Total RNA from cultured cells, MACS beads–enriched in vivo CD8+ T cells, or lung homogenates was extracted with an RNeasy Kit (QIAGEN) and treated with DNase I (Invitrogen). Random primers and Superscript II (both from Invitrogen) were used to synthesize first-strand cDNAs from equivalent amounts of RNA of each sample. RT-PCR was performed with SYBR Green PCR Master Mix (Applied Biosystems). Data were generated with the comparative threshold cycle method (27) by normalizing to hypoxanthine guanine phosphoribosyl transferase. Bone marrow–derived dendritic cells (BMDCs) were generated as previously described (28). CD8+ T cells were isolated from the spleen and lymph nodes of the indicated mice using MACS, according to the manufacturer’s protocol (Miltenyi Biotec). DCs were mixed with CD8+ T cells (5 × 104) at a 1:10 ratio in round-bottom 96-well plates in the presence of 0.1 μg/ml anti-CD3, as previously described (26). For activation of OT-I TCR-transgenic T cells, CD8+ T cells from OT-I mice were isolated and cultured with SIINFEKL (N4), SIITFEKL (T4), or SIIQFEHL (Q4H7) peptides (4 ng/ml). In some experiments, the indicated concentrations of human IL-2, IL-7, and IL-15 were included in the culture. Total RNA from cultured WT or IRF4-deficient CD8+ T cells was extracted with an RNeasy Kit (QIAGEN). Sequencing libraries were constructed from the total RNA using the Illumina TruSeq Stranded mRNA Library Prep Kit, largely as directed by the kit’s directions but with some modifications. Fragmentation time in the elute–fragment–prime step was reduced from 8 to 4 min, resulting in cDNA ranging in length from 100 to 1000 bp. Subsequent AMPure purification was performed at a sample/AMPure ratio of 1.8:1 (v/v). The resulting libraries were composed of amplicons largely ranging in length from 200 to 1000 bp. Subsequently, 8 cycles of PCR amplification were undertaken, rather than the 15 cycles specified by the instructions. Individual libraries were pooled based on titers using KAPA Library Quantification on an Applied Biosystems Step-One qPCR machine. A single pool of all six libraries was clustered on one lane of a HiSEquation 2500 High Output 2 × 100–bases read chemistry run. For bioinformatics analysis, we first processed reads using a custom Perl script to remove unreliable reads and to trim sequences with low-quality sections of each read based on the following criteria: any reads with uncalled bases and Phred quality score of 2 were rejected, and reads were trimmed when the quality score was <10 or the average score of three continuous bases was <20. Then processed reads were mapped against the reference mouse genome (GRCm38.p5) using Tophat2 (29). To quantify the read count per transcript, HTSeq (30) was used, with genome annotation downloaded from Ensembl (release 88). Differential expression analyses were performed using the DESeq2 package (31, 32). Genes with false discovery rate < 10% (adjusted p value <0.1) and >2-fold change were considered significant. All significant genes (>2-fold change and false discovery rate < 10%) were analyzed by WebGestalt (32) for Gene Ontology and Kyoto Encyclopedia of Genes and Genomes (KEGG) pathway enrichment using a hypergeometric test, with a significance level of 0.01. RNA-seq data have been submitted to the Gene Expression Omnibus under accession number GSE101510 (https://www.ncbi.nlm.nih.gov/geo/query/acc.cgi?acc=GSE101510). ChIP assays were performed as described (33). In brief, activated WT or IRF4-deficient CD8+ T cells were cross-linked for 10 min with 1% formaldehyde and fragmentized by sonication. Cross-linked cells were precleared with salmon sperm DNA, BSA, and protein G agarose (IRF4 ChIP) bead slurry (50%). Cell extracts were incubated with Abs to goat polyclonal IRF4 M-17 (Santa Cruz Biotechnology), H3K27ac (Millipore), and normal goat IgG (Santa Cruz Biotechnology) overnight at 4°C. The immunocomplexes were precipitated with Protein A agarose (H3K27ac ChIP) or Protein G agarose (IRF4 ChIP) beads at 4°C for 2 h, washed, and eluted, and cross-links were reversed at 65°C overnight. DNA was purified, suspended in H2O, and analyzed by quantitative PCR, as previously described (34). Primers for IRF4 binding to IL-2rb and IL-7ra loci were designed against their promoter region, according to current Ensembl annotation. The IRF4 binding sites for Il2rb and Il7r were determined with the TRANSFAC Transcription factor binding site database. The following primers were used for quantitative PCR: Il7r forward 5′-GCCCCAGCATTTTGAAGTT-3′, Il7r reverse 5′-GTGTCTTCTTCTTTCTGC-3′, Il2rb forward 5′-CCTGCTTCCCTTCTGTTCTG-3′, and Il2rb reverse 5′-TCTTCGAGGCCAACATGTCT-3′. Constitutive active STAT5 (STAT5-CA) and control retroviral plasmids were kindly provided by Dr. J. Zhu (National Institutes of Health) (35). Retroviral stocks were prepared by calcium phosphate transfection of Phoenix GP cells. The medium was refreshed 12 h after transfection, and viral supernatants were collected 24 and 48 h later. For retroviral transduction, CD8+ T cells were stimulated with BMDCs plus anti-CD3. At day 1 of the culture, cells were transduced with retroviruses through spin infection (2500 rpm, 90 min), as previous described (36). After transduction, cells were analyzed by flow cytometry. Fluorescence-conjugated FACS Abs were purchased from BioLegend, BD Biosciences, or eBioscience. Intracellular staining (ICS) of IRF4 was performed using a Foxp3 Staining Buffer Set (eBioscience). For IRF4 staining, IRF4-deficient CD8+ T cells were used as the negative staining control. Cells were acquired using a FACSCalibur (BD Biosciences) or Attune Acoustic Focusing Cytometer (Invitrogen), and data were analyzed with FlowJo software (TreeStar). Data are mean ± SEM of values from individual mice (in vivo experiments) or mean ± SD of values from triplicate analysis of the same sample (in vitro cell numbers and ChIP analysis). A paired or unpaired two-tailed Student t test was used. We consider p values <0.05 significant. Previous reports have established that IRF4 is vital for the generation of effector and memory CD8+ T cells (19–24). The expression of IRF4 is primarily regulated by TCR signaling, although type I IFNs were recently shown to promote IRF4 expression in CD8+ T cells (37), indicating that IRF4 expression could be potentially modulated by cytokines. Because the IL-2 family cytokines IL-2, IL-15, and IL-7 are potent modulators of effector and memory cell responses (1, 5), we investigated whether IL-2, IL-15, and/or IL-7 regulate IRF4 expression in CD8+ T cells. To this end, we first stimulated WT CD8+ T cells in vitro with BMDCs and anti-CD3 in the absence or presence of human IL-2. We found that human IL-2 inclusion enhanced IRF4 expression in CD8+ T cells (Fig. 1A). Like IL-2, IL-15 could boost IRF4 expression, whereas IL-7 only modestly increased IRF4 expression in CD8 T cells (Fig. 1B). These data suggested that IL-2 family cytokines differentially regulate IRF4 expression in CD8+ T cells. Because IRF4 expression in CD8+ T cells is influenced by the strength of TCR stimulation (22, 23, 38), we next examined whether IL-2 supplementation could differentially regulate IRF4 expression under strong and weak TCR stimulation. To this end, we activated OT-I T cells with BMDCs plus OVA (OVA257–264) SINNFEKL peptide (N4) or its low-affinity altered peptide ligands SINTFEKL (T4) and SINQFEHL (Q4H7) in the presence or absence of human IL-2. As previously reported, high-affinity TCR stimulation induced stronger and sustained IRF4 expression (N4 stimulation), whereas weak TCR stimulation induced lower and transient IRF4 expression (T4 or Q4H7 stimulation) (22, 23). IL-2 enhanced IRF4 expression in CD8+ T cells stimulated with T4 or Q4H7, but not N4, suggesting that IL-2 preferentially boosts IRF4 expression in CD8+ T cells stimulated with weak TCR signals (Fig. 1C). STAT5 is an important downstream transcription factor that mediates the effects of IL-2 and IL-15 in T cells (5, 39). Therefore, we examined whether STAT5 activation promotes IRF4 expression. To this end, we transduced activated CD8+ T cells with control retrovirus or retrovirus containing STAT5-CA (35). We found that constitutive STAT5 activation promoted IRF4 expression in CD8+ T cells (Fig. 1D). Although we could not rule out the possibility that STAT5-independent pathways, such as the PI3K/AKT signaling pathway, may regulate IRF4 expression in CD8+ T cells (40), these data suggested that STAT5 activation downstream of IL-2 and IL-15 signaling contributes to the upregulation of IRF4 expression in CD8+ T cells. IRF4 expression is modulated by the signaling of IL-2 family cytokines. (A) Purified WT C57BL/6 CD8+ T cells were activated in vitro in the presence or absence of human IL-2 (150 U/ml). IRF4 expression in CD8+ T cells was determined using ICS on different days. (B) Purified WT C57BL/6 CD8+ T cells were activated in vitro in the presence or absence of IL-15 or IL-7 (50 ng/ml). 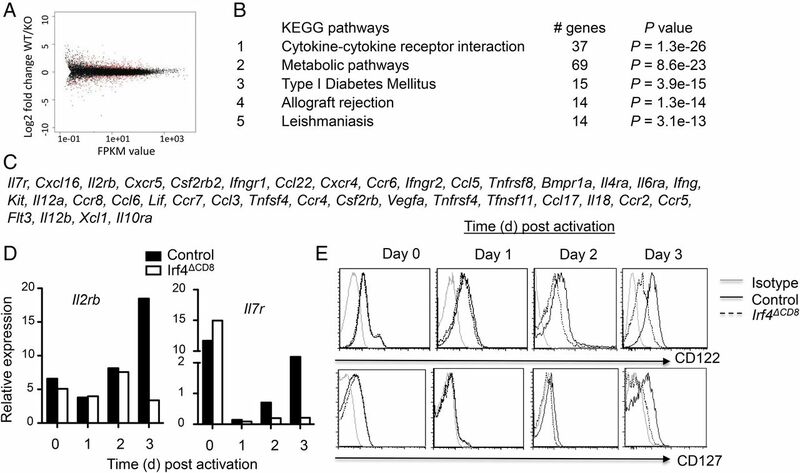 IRF4 expression in CD8+ T cells was determined using ICS at day 2 postactivation. (C) Purified OT-I T cells were activated in vitro with N4, T4, or Q4H7 peptides in the presence or absence of human IL-2 (150 U/ml). IRF4 expression in CD8+ T cells was determined using ICS on different days. (D) Purified WT C57BL/6 CD8+ T cells were activated for 1 d and then cells were transduced with control retrovirus or retrovirus harboring STAT5-CA. IRF4 expression in transduced CD8+ T cells was determined using ICS at days 1 and 2 posttransduction. Data are representative of at least three experiments (A–C) or two experiments (D). To better understand the underlying molecular mechanisms by which IRF4 regulates CD8+ T cell responses, we performed next-generation RNA-seq analysis on activated control and IRF4-deficient CD8+ T cells. We found that >900 genes were differentially regulated in control and IRF4-knockout T cells (Fig. 2A). We next performed KEGG pathway analysis of the genes that were differentially expressed between control and IRF4-deficient CD8+ T cells. As shown in Fig. 2B, the cytokine–cytokine receptor interaction pathway is the pathway that is most significantly differentially regulated in control and IRF4-deficient CD8+ T cells: 37 genes of this pathway were differentially expressed (Fig. 2C). As reported previously (23), we found that IRF4-deficient CD8+ T cells had diminished expression of many genes related to cellular metabolism (Fig. 2B). Among the cytokine receptors that are differentially expressed between control and IRF4-deficient CD8+ T cells, we found that Il7r (CD127) and Il2rb (CD122, shared by IL-2 and IL-15 signaling) were downregulated in IRF4-deficient CD8+ T cells (Fig. 2C). We confirmed the RNA-seq data using real-time RT-PCR (Fig. 2D). Flow cytometry analysis of the surface expression of CD127 and CD122 further confirmed the diminished expression of CD127 and CD122 on IRF4-deficient CD8+ T cells (Fig. 2E). Given that IL-2 and IL-15 could potently regulate IRF4 expression, these data suggested that a cytokine feed-forward loop exists on IRF4 regulation to potentially promote CD8+ T cell activation, expansion, and effector differentiation. IRF4 regulates cytokine receptor expression in CD8+ T cells. (A) Purified control (Irf4 fl/fl) or IRF4-deficient CD8+ T cells were activated in vitro, and mRNA was extracted for RNA-seq analysis at day 2 postactivation. A total of 901 genes (red dots, adjusted p value <0.1) was differentially expressed in WT and IRF4-deficient CD8+ T cells following activation. (B) Differential genes expressed between control (Irf4 fl/fl) and IRF4-deficient CD8+ T cells underwent KEGG pathway analysis. The top five affected pathways are listed. (C) List of 37 genes in the cytokine–cytokine receptor interaction pathway that were differentially expressed between control (Irf4 fl/fl) and IRF4-deficient CD8+ T cells. (D and E) Purified control (Irf4 fl/fl) or IRF4-deficient CD8 T cells were activated in vitro. Il7r (CD127) and Il2rb (CD122) gene expression (D) or surface protein levels (E) were determined by real-time RT-PCR and flow cytometry, respectively. Data are from two replicates of one experiment (A–C) or from at least three experiments (D and E). IRF4 can work as a transcriptional activator to induce many downstream genes, including cell-cycle related genes, metabolic genes, and effector molecules (20–24, 38). Therefore, we examined whether IRF4 binds directly to CD127 (Il7r) and CD122 (Il2rb) gene loci to potentially regulate their expression. We found that Il7r and Il2rb loci contain IRF4 binding sites using TRANSFAC (Fig. 3A, 3B). ChIP assay confirmed IRF4 binding to Il7r and Il2rb loci in WT CD8+ T cells but not in IRF4-deficient CD8+ T cells (Fig. 3A, 3B). Epigenetic chromatin modifications, such as the acetylation of H3K27, usually mark open chromatin that is accessible for gene transcription. Therefore, we examined H3K27 acetylation in the Il7r and Il2rb promoter regions in activated control and IRF4-deficient CD8+ T cells. We found that IRF4 deficiency resulted in reduced H3K27 acetylation in the Il7r and Il2rb gene loci. Together, these data demonstrated that IRF4 directly binds and promotes epigenetic modifications at CD122 and CD127 gene loci. IRF4 binds to and regulates histone acetylation of Il7r and Il2rb loci. Purified control (Irf4 fl/fl) or IRF4-deficient CD8+ T cells were activated in vitro. (A) IRF4 binding site at the Il7r locus (left panel); IRF4 binding to the Il7r locus in control or IRF4-deficient CD8+ T cells was determined by ChIP (right panel). (B) IRF4 binding site at the Il2rb locus (left panel); IRF4 binding to the Il2rb locus in control or IRF4-deficient CD8+ T cells was determined by ChIP (right panel). (C) H3K27 acetylation in Il7r and Il2rb promoter regions of control or IRF4-deficient polyclonal CD8+ T cells was determined by ChIP. Data are representative of four independent experiments. Because IRF4 regulates CD127 and CD122 expression on CD8+ T cells, we next examined whether IRF4 potentiates CD8+ T cell expansion in response to cytokine signaling. To this end, we examined whether IRF4 is required for cytokine-induced CD8+ T cell proliferation in vitro. We activated CD8+ T cells in the absence or presence of increasing concentrations of IL-2, IL-7, or IL-15. As expected, addition of IL-2, IL-7, or IL-15 increased control CD8+ T cell expansion (Fig. 4). However, IRF4 deficiency impaired CD8+ T cell expansion in response to IL-2, IL-7, or IL-15 (Fig. 4), suggesting that IRF4 regulates the response of CD8+ T cells to IL-2 family cytokines. 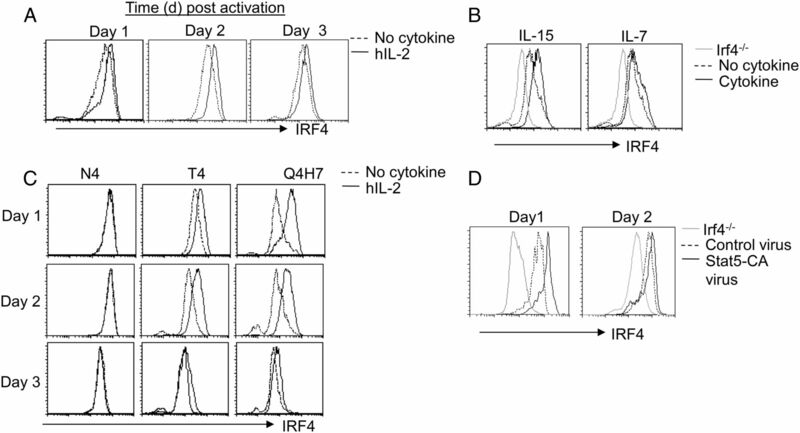 IRF4 expression regulates the sensitivity of CD8+ T cells to IL-2, IL-15, and IL-7. (A) Purified control (Irf4 fl/fl) or IRF4-deficient CD8+ T cells were activated in vitro with increasing amounts of human IL-2 in the presence of neutralizing mouse IL-2 Ab. Live CD8+ T cell numbers were determined daily following activation. (B) Purified control (Irf4 fl/fl) or IRF4-deficient CD8+ T cells were activated in vitro with increasing amounts of IL-7. Live CD8+ T cell numbers were determined daily following activation. (C) Purified control (Irf4 fl/fl) or IRF4-deficient CD8+ T cells were activated with increasing amount of IL-15. Live CD8+ T cell numbers were determined daily following activation. Data are representative of two independent experiments. To examine whether IRF4 is required for cytokine receptor expression on CD8+ T cells in vivo, we infected WT or Irf4ΔCD8 mice with influenza A/PR/8 and then examined CD127 and CD122 expression on Ag-specific NP366–374 tetramer+ CD8+ cells at day 9 postinfection. As previously reported (22), Irf4ΔCD8 mice mounted greatly diminished influenza-specific T cell responses in vivo (Fig. 5A). 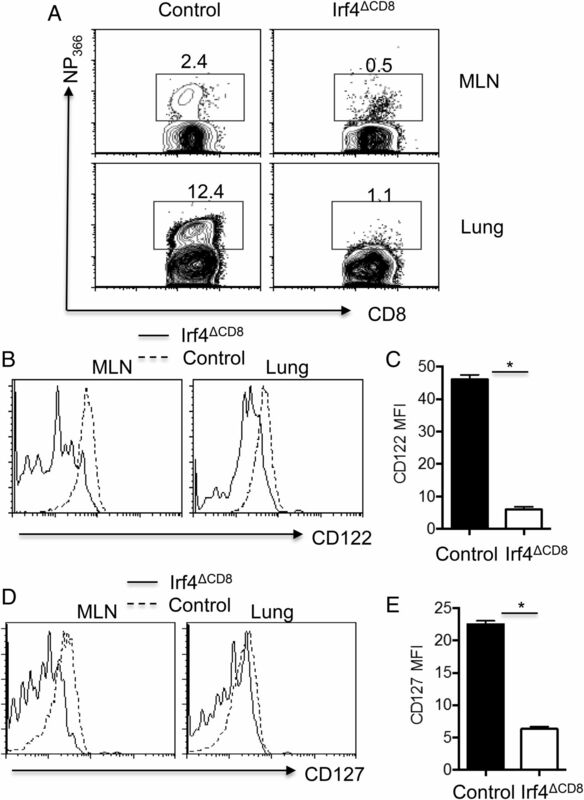 In accordance with the diminished CD122 observed in vitro, CD122 expression on influenza-specific CD8+ T cells from draining mediastinal lymph nodes (MLNs) and the lungs were diminished in the absence of IRF4 (Fig. 5B, 5C). Similarly, we observed diminished CD127 expression on influenza-specific CD8+ T cells in vivo (Figs. 5D, 5E). These data suggest that IRF4 is required for CD122 and CD127 expression on Ag-specific CD8+ T cells in vivo (Fig. 6). IRF4 regulates surface CD122 and CD127 expression on CD8+ T cells in vivo following influenza infection. Control (Irf4 fl/fl) and Irf4ΔCD8 mice were infected with influenza. CD122 and CD127 expression on MLN and lung CD8+ T cells was determined at day 9 postinfection. (A) Influenza-specific NP366–374 tetramer staining in draining MLNs and lungs. (B) CD122 expression on CD8+ NP366–374 tetramer+ cells from draining MLNs and lungs of control or Irf4ΔCD8 mice. (C) Mean fluorescence intensity (MFI) of CD122 on CD8+ NP366–374 tetramer+ cells from draining MLNs of infected control or Irf4ΔCD8 mice. (D) CD127 expression on CD8+ NP366–374 tetramer+ cells from draining MLNs and lungs of control or Irf4ΔCD8 mice. (E) MFI of CD127 on CD8+ NP366–374 tetramer+ cells from draining MLNs of infected control or Irf4ΔCD8 mice. Data are representative of two independent experiments. p < 0.05. Integrated model of IRF4 and IL-2 family cytokine signaling in regulating effector and memory CD8+ T cell responses. Taken together, we have identified that IL-2 family cytokines IL-2 and IL-15 could modulate IRF4 expression via STAT5 signaling and, conversely, that IRF4 is vital for expression of the receptors of IL-2 family cytokines, including CD122 and CD127. Thus, these data suggest that IRF4 may be a key factor regulating a cytokine feed-forward loop to promote CD8+ T cell responses. Furthermore, because IRF4 expression is also controlled by the strength of TCR stimulation, IRF4 may link graded TCR signals to CD8+ T cell sensitivity to cytokines (Fig. 6). In this model, productive TCR stimulation promotes IRF4 expression, which leads to the synthesis of key cytokine receptors and sensitizes CD8+ T cell responses to cytokines. Subsequently, cytokines further potentiate and sustain IRF4 expression in activated CD8+ T cells to promote effector CTL responses. Understanding the exact mechanisms by which IRF4 modulates the interplay of TCR and cytokine signaling to promote effective CTL responses could provide new insights into the molecular regulation of CD8+ T cell responses against pathogens and cancerous cells; in particular, IL-2 and IL-15 have been used as promising antitumor agents (41, 42). We thank Dr. Jinfang Zhu for the STAT5-CA plasmids and the National Institutes of Health Tetramer Core Facility for tetramers to detect influenza-specific CD8+ T cells. This work was supported by National Institutes of Health Grants AI112844, AG047156, and AI076458 (to J.S.) and R01 AI095282 and AI057459 (to M.H.K.). The RNA sequencing data presented in this article have been submitted to the Gene Expression Omnibus (https://www.ncbi.nlm.nih.gov/geo/) under accession number GSE101510. 2011. Memory T cells as an occupying force. Eur. J. Immunol. 41: 1192–1195.
. 2014. Insights into the initiation of TCR signaling. Nat. Immunol. 15: 798–807.
. 2011. CD8(+) T cells: foot soldiers of the immune system. Immunity 35: 161–168.
. 2013. Interleukin-2 at the crossroads of effector responses, tolerance, and immunotherapy. Immunity 38: 13–25.
. 2012. The role of interleukin-2 during homeostasis and activation of the immune system. Nat. Rev. Immunol. 12: 180–190.
. 2011. Cytokines and the inception of CD8 T cell responses. Trends Immunol. 32: 180–186.
. 2014. Impact of inflammatory cytokines on effector and memory CD8+ T cells. Front. Immunol. 5: 295.
. 2012. 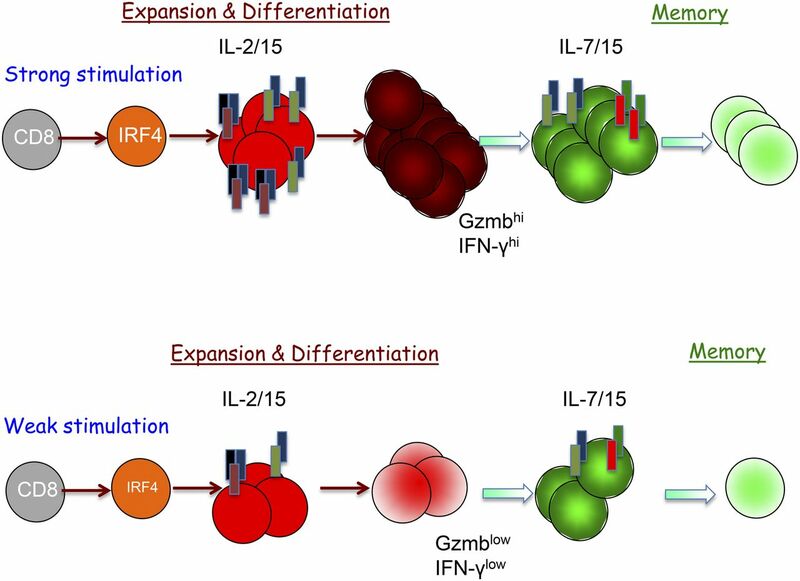 Functions of IL-15 in anti-viral immunity: multiplicity and variety. Cytokine 59: 467–478.
. 2012. Interleukin-15 biology and its therapeutic implications in cancer. Trends Pharmacol. Sci. 33: 35–41.
. 2010. Regulation of memory T cells by γc cytokines. Cytokine 50: 105–113.
. 2007. Cytokines and T-cell homeostasis. Curr. Opin. Immunol. 19: 320–326.
. 2007. Naive CD8+ T cells differentiate into protective memory-like cells after IL-2 anti IL-2 complex treatment in vivo. J. Exp. Med. 204: 1803–1812.
. 2011. Autocrine IL-2 is required for secondary population expansion of CD8(+) memory T cells. Nat. Immunol. 12: 908–913.
. 2006. Interleukin-2 signals during priming are required for secondary expansion of CD8+ memory T cells. Nature 441: 890–893.
. 2010. IL-15 trans-presentation by pulmonary dendritic cells promotes effector CD8 T cell survival during influenza virus infection. J. Exp. Med. 207: 521–534.
. 2014. Graded levels of IRF4 regulate CD8+ T cell differentiation and expansion, but not attrition, in response to acute virus infection. J. Immunol. 192: 5881–5893.
. 2014. IRF4 at the crossroads of effector T-cell fate decision. Eur. J. Immunol. 44: 1886–1895.
. 2014. IRF4 and BATF are critical for CD8+ T-cell function following infection with LCMV. Cell Death Differ. 21: 1050–1060.
. 2013. Interferon regulatory factor 4 sustains CD8(+) T cell expansion and effector differentiation. Immunity 39: 833–845.
. 2013. The transcription factor IRF4 is essential for TCR affinity-mediated metabolic programming and clonal expansion of T cells. Nat. Immunol. 14: 1155–1165.
. 2013. The transcription factor interferon regulatory factor 4 is required for the generation of protective effector CD8+ T cells. Proc. Natl. Acad. Sci. USA 110: 15019–15024.
. 2008. Notch2 integrates signaling by the transcription factors RBP-J and CREB1 to promote T cell cytotoxicity. Nat. Immunol. 9: 1140–1147.
. 2009. Effector T cells control lung inflammation during acute influenza virus infection by producing IL-10. Nat. Med. 15: 277–284.
. 2008. Analyzing real-time PCR data by the comparative C(T) method. Nat. Protoc. 3: 1101–1108.
. 2007. Suppression of early IL-4 production underlies the failure of CD4 T cells activated by TLR-stimulated dendritic cells to differentiate into Th2 cells. J. Immunol. 178: 1635–1644.
. 2013. TopHat2: accurate alignment of transcriptomes in the presence of insertions, deletions and gene fusions. Genome Biol. 14: R36.
. 2015. HTSeq--a Python framework to work with high-throughput sequencing data. Bioinformatics 31: 166–169.
. 2013. WEB-based GEne SeT anaLysis toolkit (WebGestalt): update 2013. Nucleic Acids Res. 41: W77–W83.
. 2011. The transcription factor STAT3 is required for T helper 2 cell development. Immunity 34: 39–49.
. 2012. Twist1 regulates Ifng expression in Th1 cells by interfering with Runx3 function. J. Immunol. 189: 832–840.
. 2003. Stat5 activation plays a critical role in Th2 differentiation. Immunity 19: 739–748.
. 2008. Suppression of Th2 cell development by Notch ligands Delta1 and Delta4. J. Immunol. 180: 1655–1661.
. 2016. Type I IFN signaling facilitates the development of IL-10-producing effector CD8(+) T cells during murine influenza virus infection. Eur. J. Immunol. 46: 2778–2788.
. 2012. TCR signaling via Tec kinase ITK and interferon regulatory factor 4 (IRF4) regulates CD8+ T-cell differentiation. Proc. Natl. Acad. Sci. USA 109: E2794–E2802.
. 2005. Cell biology of IL-7, a key lymphotrophin. Cytokine Growth Factor Rev. 16: 513–533.
. 2015. Anticancer cytokines: biology and clinical effects of interferon-α2, interleukin (IL)-2, IL-15, IL-21, and IL-12. Semin. Oncol. 42: 539–548.
. 2016. Common gamma chain cytokines in combinatorial immune strategies against cancer. Immunol. Lett. 169: 61–72.